San Juan de Ulua, a tale of decay, an old penitentiary, the feared prison of famed inmates like Fray Servando Teresa de Mier, Benito Juarez and "Chucho El Roto". For some, it was a place of dread. For others, it is a historical site where the stories of those fateful walls fell on deaf ears. Veracruz, the mother of history and of pain. Here you can find the fort commonly known as San Juan de Ulua, named in honor of Captain Juan de Grijalva, and without a doubt, one of the main attractions in Veracruz. The "Ulua" came from an old legend that tells of when the Spaniards came and witnessed two young people being sacrificed. They asked an indigenous woman what was happening and were told that the locals, the Culua, were having them sacrificed to honor the gods. 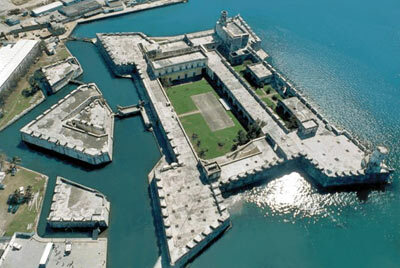 Construction began on the island in 1535, under the guidance of Antonio de Mendoza, and took 172 years to finish. To build this fort, a mortar made out of oyster shells, turtle eggs, sand and salt water was made, making the walls resistant to the north winds that were frequent in the area. It rapidly became a point of entry and departure, as well as a stronghold. The most representative feature of the fort was the "Muro de las Argollas" (the Wall of Rings) where there were around 35 rings to tie the boats to the port. In this fashion, they were able to protect the ships from the winds that whipped through the port, preventing them from crashing into each other during bad weather. The Fort of San Juan de Ulua was also used as a warehouse where precious metals were stored and then later sent to Spain. Each arch reflected a different architectural style, from the midpoint to the elliptical vaults, enhancing the structure. In 1601, the Casa del Gobernador (the House of the Governor)was built and this was where the administrator of the fort lived and took care of the riches under his custody, which were later sent to Spain. The building later became the residence of Benito Juarez, Porfirio Diaz and Venustiano Carranza, who wrote the Constitution of 1917 on its cold walls. Finally, the fort was used as a prison. With torture and abuse of the prisoners, many ended their lives battered and shamed. On occasion, the tide would rise and flood the fort, forcing the prisoners to stay close to the walls. The water would even form stalactites and the walls would be covered with salt, giving it an eerie and cold look. The fort was named "Cuatro Veces Heroica" (Four Times Heroic) for having defended the national sovereignty on four different occasions: in 1825, when the last of the Spanish troops surrendered; in 1838, when the French attacked, starting the first French intervention in Mexico (also known as the Pastry War); in 1847, when American troops attacked during the War of Intervention; and then finally in 1914, defending against the disembarking American troops. If you ever visit the Port of Veracruz, come and explore this historic jewel and learn about the history buried deep within the fort. You'll find stalactites and salt-stained walls, a part of an ever-living history, despite its decay.